This 2 bed in Barna near Dunkerrin in Co. Offaly is an original stone cottage. It is situated in a stunning setting with panoramic views of the surrounding countryside and standing on approx 0.4 of one acre. The property comes with teak singled windows throughout and original slate roofing. 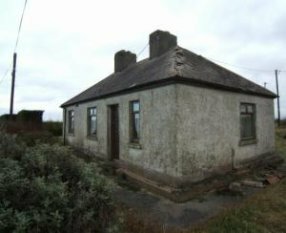 Although the property description says that the house needs to be fully restored, I am not totally convinced. Yes, the outside could do with a bit of taming however indoors isn’t all so bad and is defiantly habitable whole scheming your redecorating / remodeling plans.